It took a try by George Ford in the final play of the game to rescue England as the injury-ravaged Scots stood on the brink of completing the greatest comeback in tournament history. Wales received the Grand Slam trophy at the Principality Stadium just moments before Eddie Jones' players exited the tunnel, a 25-7 victory over Ireland elevating them to the pinnacle of European rugby. Avenging last year's bitter defeat at Murrayfield was now England's aim and as they ran in four tries to build a 31-0 lead inside half an hour, they were on track to mark their last competitive match before the World Cup with an ominous statement. But it was the prelude to a stunning riposte from Scotland, who ran in the next five tries, two of them finished by jet-heeled wing Darcy Graham, as the overwhelming favourites fell to pieces. 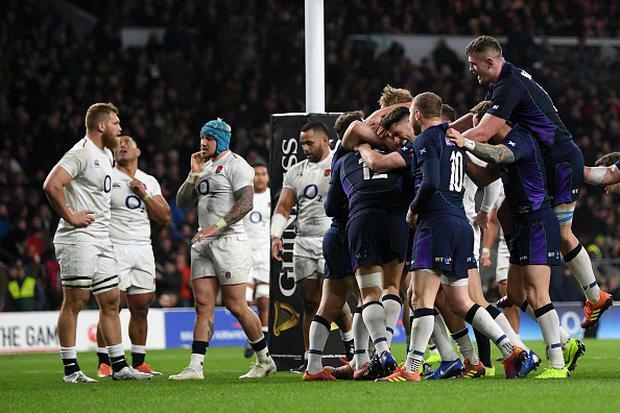 Tied at 31-31, the final game of the 2019 Six Nations was to be decided by a thrilling final quarter as delirious Scottish fans rubbed their eyes in disbelief at the drama unfolding before them. England were rattled and replacement scrum-half Greig Laidlaw fell short with a long-range penalty attempt in swirling conditions that if successful would have seen them creep ahead for the first time. But that moment duly arrived with four minutes remaining and once again it was the home midfield that waved Scotland through, but the try still took some scoring from centre Sam Johnson, who broke three despairing tackles to touch down. Exhausted and bewildered, England summoned the strength for one last assault that saw Ford sprint over to level the final score, although as holders the Scots retained the Calcutta Cup. There appeared to be only one outcome as England crossed with just 66 seconds on the clock. Elliot Daly sprinted through a non-existent midfield and fed Henry Slade, whose own run ended when Jack Nowell picked a sharp line that swept him over. Ben Moon limped off after tacking a big tackle on his ribs but the setback failed to dent momentum as Tom Curry was on the end of a short-range line-out drive. Scotland were already disintegrating but it was a fine carry and brilliant offload that saw Ellis Genge - who had replaced Moon - find Kyle Sinckler in support in precise interplay from the props. Sinckler barrelled into Sean Maitland and the ball was worked right where Joe Launchbury dummied his way over. Daly was causing havoc, with one pass out of the tackle almost leading to a try, and the full-back was involved as England counter-attacked from inside their 22. Slade had sight of the line as he galloped down the left touchline and at the perfect moment he slipped a sublime pass to Jonny May, who cut inside to touch down. The one-way traffic was halted when Stuart McInally charged down an Owen Farrell kick, grabbed the ball and won the race to the line, shrugging off a tackle by May in the process. And it was slick passing and clever lines that opened England up in the 48th minute, the backs interchanging wonderfully until Graham jinked his way over in the left corner. The Scottish resurgence continued when Ali Price kicked and collected to give number eight Magnus Bradbury the chance to show his pace as the home defence was beaten too easily once more. It was now England who were falling apart and it was the midfield where the visitors were running amok as incisive play gave Graham his second try that was finished when the wing switched on the afterburners. And the comeback was complete when Farrell's sluggish pass in a sluggish move was picked off by Finn Russell, who ran half the pitch to drive over. With the score level, a grandstand finish awaited and it was one England were lucky to play with 15 men after Farrell escaped punishment for a shoulder-led tackle on Graham. Laidlaw's penalty lacked the legs and Farrell was replaced by George Ford as the tension ramped up, before Johnson and Ford exchanged tries in a heart-stopping finish.